The German-based beer company Beck’s is publicizing their new “record label” based in Auckland, New Zealand with a distinctive musical playback system: a glass variation of the old-fashioned phonograph technology invented in 1877 by Thomas Edison (the same year Beck’s was founded in Europe). 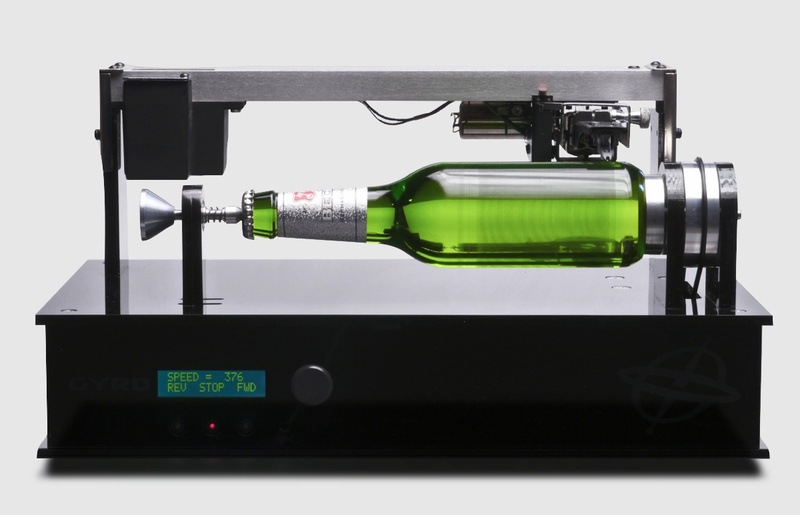 Replacing the 19th-century phonograph’s wax cylinder with a machine-made green glass beer bottle, the process is also highly contemporary as the music is etched into the glass bottle using a hard drive arm to encode the digital track as the Beck’s bottle was turning on a lathe. The result is being billed as the world’s first glass bottle to be encoded with a music recording, and was unveiled at the Semi-Permanent Design Conference in Auckland, New Zealand last month. Beck’s has been showcasing “the world’s first playable beer bottle” by having it engraved with the Auckland-based band Ghost Wave‘s new single, “Here She Comes.” The song was inscribed into the inner edges of the bottle and the musical effluence is propelled by a hard drive recording head. With the use of some additional software, the song clearly reverberates. The use of glass in producing music is not a new technology, but a familiar one dating back to the 14th century Renaissance. English philosopher Francis Bacon as well as the Italian astronomer Galileo have both written about the auditory effects of applying a wet finger to the rim of a glass chalice; countless other individuals have experimented with the different pitches arising from stroking glasses of various sizes and with different water quantities. Eventually, Benjamin Franklin devised the glass armonica—an instrument operated by a foot pedal and composed of graduated glass bowls rotating on an iron spindle—later utilized by Mozart and Beethoven among several other distinguished musicians. Today, one can find glass utilized in the verrophone, cristal baschet, harp, xylophone, and organ. The science behind the music lies in the friction and vibration that comes from stroking the glass. The vibrations create sound waves, which vary in pitch depending on the of the vibration’s speed. When the resonance is in sync with the natural frequencies of the glass molecules, sound emerges. Any impurities or obstructions in the glass will affect the vibrations and the resulting sounds—which is why Beck’s beer bottle is seamlessly constructed. The more consistent the surface, the more the glass molecules vibrate at the same frequency and produce a smooth sound. Thus, when the recording head touches the glass surface of Beck’s beer bottle, the vibration yields a harmony reliant on the ringed inscriptions in the surface, which have been deliberately construed to fit “Here She Comes.” While men of past centuries have enjoyed experimenting how they applied their wet fingers to glass rims, today’s generation finds amusement in this age-old concept’s application to a beer bottle. Beck’s beer bottle apparatus was created in conjunction with the New Zealand indie recording studio Arch Hill Recordings, the British media production company Shine Limited, and the New Zeland model-making company Gyro Constructivists.